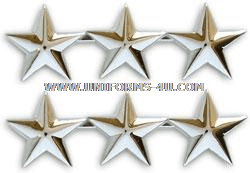 Three silver stars arrayed in a point-to-point configuration are used as collar grade insignia for Vice Admirals in the U.S. Navy and Coast Guard and for Lieutenant Generals in the Marine Corps. 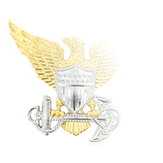 In the Marine Corps, Major Generals wear collar grade insignia on khaki shirts (even when service or dress sweaters are worn over them) and on the collars of utility and camouflage maternity coats; collar grade insignia is mandatory at all times for officers wearing the Service “A” uniform. The stars are centered between the top and bottom edges of the collar, with the outermost edge placed one inch from the front of the collar and positioned so that one ray of each star points toward the collar’s top edge. 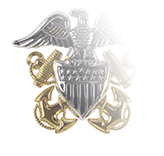 Navy Vice Admirals wear collar grade insignia on the collars of the short-sleeve shirt worn with the Service Khaki uniform, while Coast Guard Vice Admirals wear them with the Winter Dress Blue uniform and with the light blue shirt of the Service Dress Blue uniform when the jacket has been removed. The stars are positioned an inch from front and lower edges of the collar, with a single ray of each star pointing at right angle to the top of the collar; the vertical axis of the insignia should be perpendicular to an imaginary line bisecting the collar through the collar point. 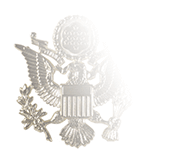 Three point-to-point stars also serve as the cap rank insignia on Garrison Caps. Navy and Coast Guard regulations call for the leading edge (closest to the front of the cap) to be placed two inches from the cap’s front crease and the entire array an inch-and-a-half from the bottom of the cap, with a single ray from each star pointing upward. 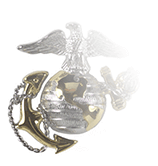 Marine Corps regulations call for the insignia to be placed in such a way that it is bisected by the cap’s flap and that the insignia in turn bisects the flap. 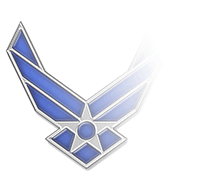 All three services call for the grade insignia to be worn on the right side of the Garrison Cap.